My friend Ted loaned me this fabulous Victorian cookbook that has the cutest graphics in it! This image is from that cookbook and features a darling 4 tiered cake as well as a variety of other cakes. Wouldn’t this be fun to use with the Marie Antoinette clip art piece that I posted a couple of days ago?! 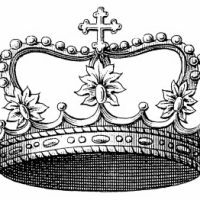 Vintage Clip Art Image – Delicate Princess Crown Vintage Diamond Ring Clip Art! 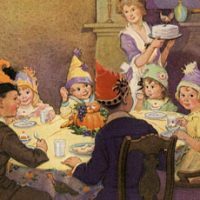 Vintage Thanksgiving Children’s Party Image! Yes it would Karen. I made a tag using the Marie, and it says EAT CAKE! Oh, I bet your tag is adorable!! I’m glad you like it, thanks for stopping by. Nice to see you again, I’m so glad you like this one.